Der Krieg in Deutschland und Frankreich in den Jahren 1813 und 1814. Komplett in 3 Bänden + Der Krieg des verbündeten Europa gegen Frankreich im Jahre 1815. Komplett in 1 Band. 8. 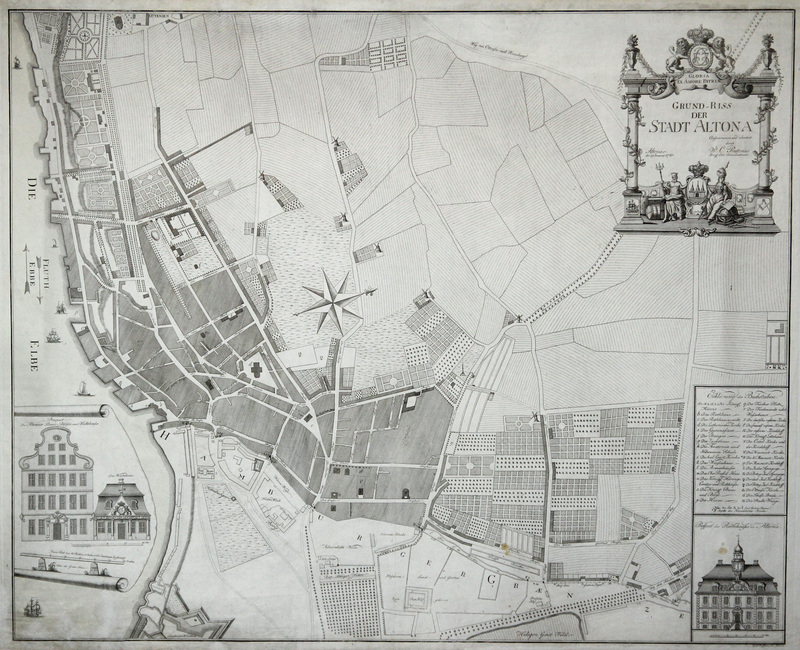 Mit 128 teils gefalteten Beilagen und 1 mehrfach gefalteten Plan von Wittenberg. VIII, 256 S., 171 S. (Beilagen) 557 S., 123 S. (Beilagen) 527 S., IV, 172 S. (Beilagen), VIII, 434 S., IV, 178 S. (Beilagen). Papbände der Zeit. 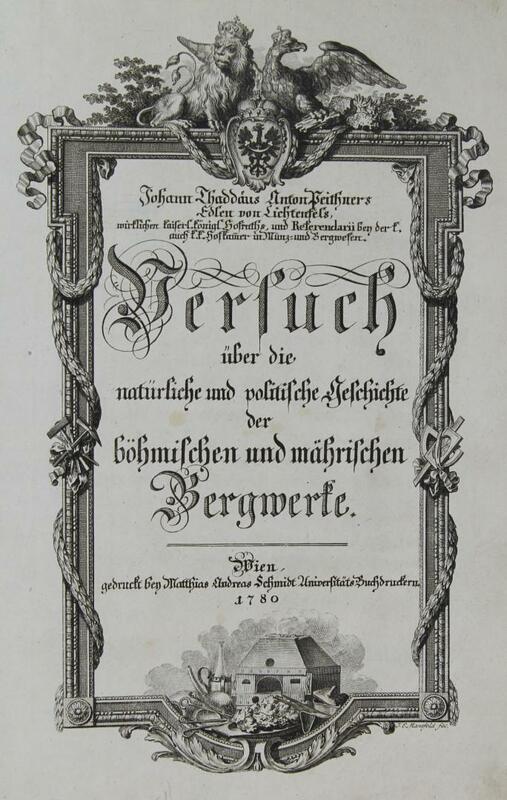 - Carl Johann Joachim Friedrich Edler Herr und Freiherr von Plotho (1780 - 1820), königlich-preußischer Oberstleutnant der Infanterie sowie Militärhistoriker und Schriftsteller. In seinem hier vorliegenden vierteiligen Hauptwerk beschreibt er die Befreiungskriege unter militärischen Gesichtspunkten in allen Einzelheiten, so dass sich die täglichen Truppenbewegungen nachverfolgen lassen. Seine Beilagen enthalten wertvolles familienkundliches Material, aber auch formationsgeschichtliche Details. Da die letzte gedruckte Rangliste der preußischen Armee schon 1806 veröffentlicht wurde, gibt das Werk auch Aufschluss über das neue Offizierskorps, das durch die Heeresreform geschaffen wurde (Einführung des Krümpersystems und die Gründung der Landwehr durch Scharnhorst und Gneisenau). Einbände berieben und bestoßen. Innen stellenweise stockfleckig doch wohlerhalten. B "Vue de la Maison des Orphelins et des environs, prise hors de la porte de Strahlow. Dedieé à Son Excellence le Marquis de Lucchesini, Chambellan de Sa Maj. Prussienne". B "Vue de la Maison des Orphelins et ses environs, prise hors de la porte de Strahlow. Dediés à Son Exellence le Marquis de Lucchesini, Chambellan de la Maj. Prussiene". - Antique Master Print, titled: 'Acheve ton ouvrage noublie pas la derniere.' - ('Complete your work, don't forget the last'). 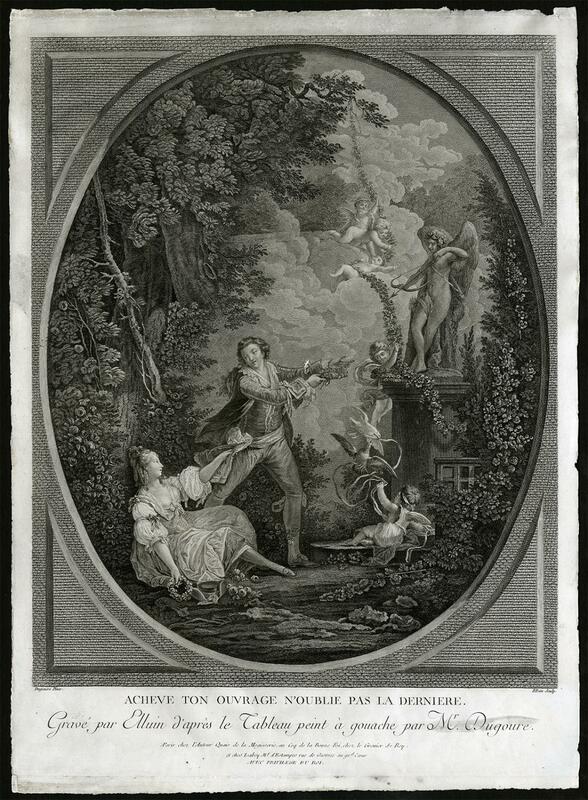 Romantic scene in a garden, with a couple on the left, a cupid playing with two doves, cupids with a long garland, and a statue of Cupid (aiming at the man). Etching / engraving on laid paper. 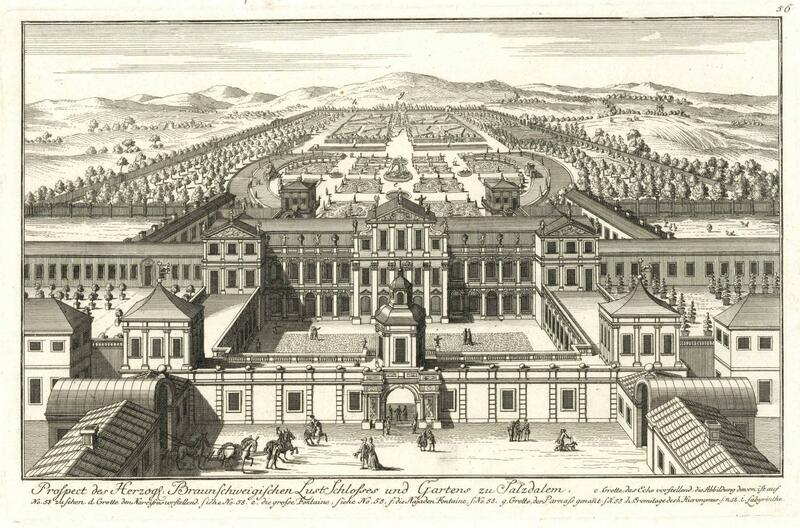 Description: Source unknown, to be determined.Artists and Engravers: Made by 'François-Rolland Elluin' after 'Dugoure'. François-Rolland Elluin(1745-1810) was a Frenchengraver, notoriously known for his illustrations oferotic scenes. Jean-Demosthene Dugourc (1749-1825), French artist. Condition: Good, given age. Margins cropped close to the plate edge. Stains in margin. Irregular paper edges. A small spot of surface damage in the middle of the image. A stain in the caption below the image. General age-related toning and/or occasional minor defects from handling. Please study scan carefully. Storage location: GV-B1-06 The overall size is ca. 14.8 x 20.4 inch. The image size is ca. 14.8 x 19.8 inch. The overall size is ca. 37.5 x 51.8 cm. The image size is ca. 37.5 x 50.3 cm. 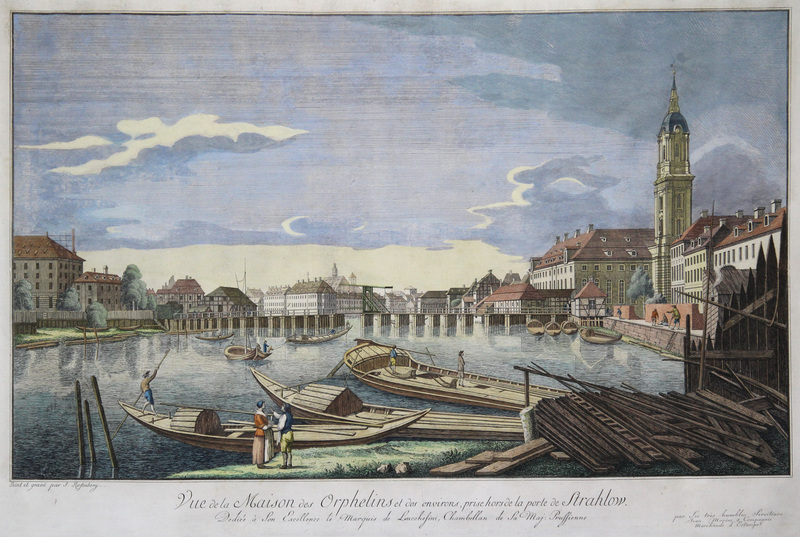 B "Vue du Marché de Hack, prise de la Rue d'Orangebourg, avec le Pont de Spandau, et l'Eglise Ste. Marie dans l'éloignement. Dediée à Son Excellence, Monsieur de Hertzberg, Ministre d'Etât de Guerre & du Cabinet du Roi, Seigneur de Britz, de Lotttin, & de plusieurs autres terres.". Tarif-Aufsatz ad monendum. [Austria/Hungary, ca. 1780]. 1780. Folio. 103 written pages on 67 ff. (pre-printed forms). Contemporary boards with ms. cover label. 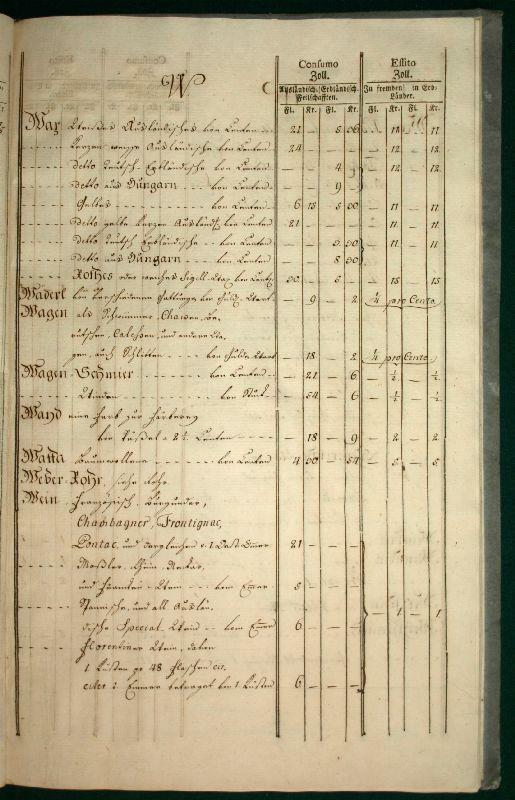 A late-18th-century Austrian deskbook for customs officials listing the applicable import and export tariffs for a great variety of goods from and to the Hungarian territories and the foreign and Austrian countries. This main section ("Consumo, und Essito") is followed by the appendices "Transito" (transit duties) and "Rückzoll" (duty drawback). 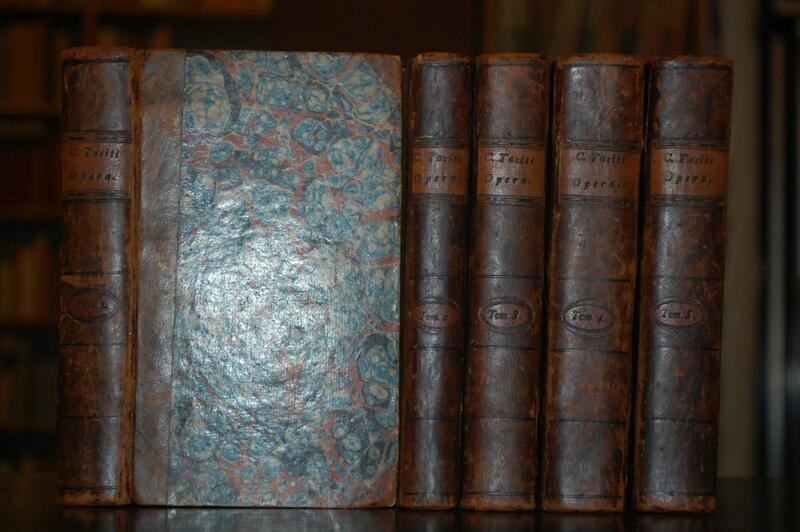 - Binding duststained and slightly buckled; extremeties rubbed and bumped. Interior clean and well-legible. Prospectus Domus Regie concentibus Musicis Berolini consecratae e regione palatii regii - Vista de la casa, O Del Teatro de L'Opera, de Berlin en fronte de Palcio Real". TA., Alter Markt, "Prospect von Dresden nach der Ansicht eines Theils des alten Marckts, von der Seiten der Heil. Creuz Kirchen und des neuen Thors. - Vue de dresde .". 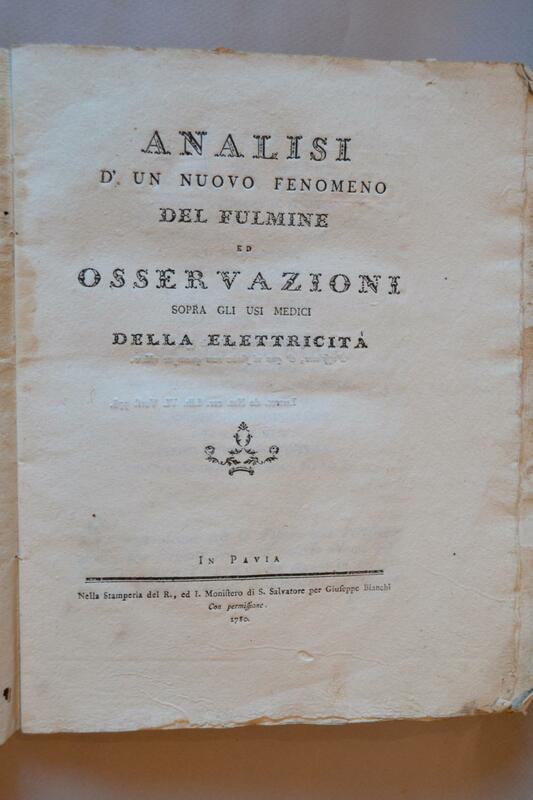 Analisi d'un nuovo fenomeno del fulmine ed osservazioni sopra gli usi medici della elettricita. Ansicht der Stadt Neapel. - Vue de la ville de Naples prise du Bastion applÈ il Torrione del Carmine. 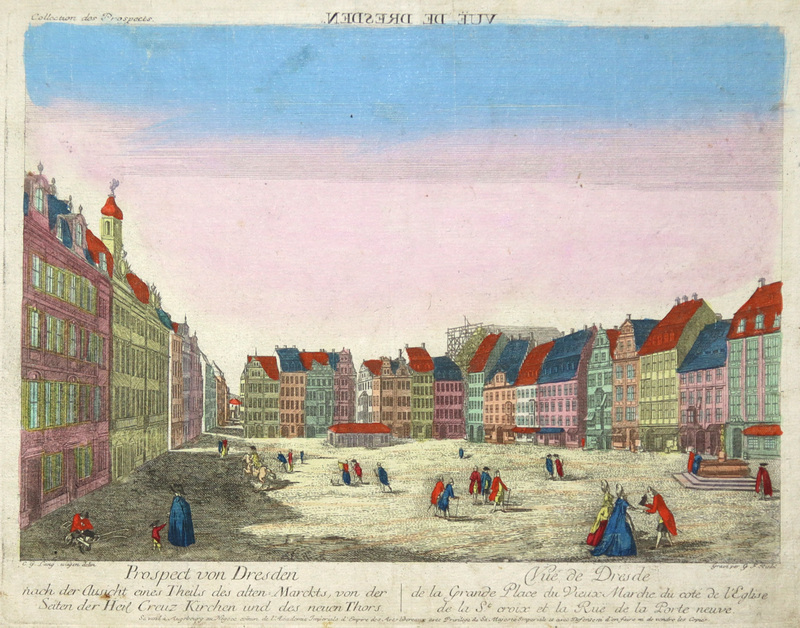 Augsburg 1780 - Incisione in rame, coloritura originale d'epoca, 300x380 Non comune veduta ottica: queste stampe pubblicate per l'utilizzo nel Mondo Nuovo sono sempre semplici nel tratto, colorate con poche tinte in maniera rapida e decisa, affascinano per la loro immediatezza. Le vedute erano preparate per essere inserite nel Mondo Nuovo, dove i popolani potevano vederle illuminate e conoscere cosÏ le citt? del mondo. Bell'esemplare, rifilato all'immagine ed applicato sopra ad un'altra incisione ottica raffigurante l'interno della Basilica di San Pietro; il margine inf. con il titolo Ë conservato, mentre gli altri margini sono anticamente applicati ed anneriti. Ben conservato. vedutistica. 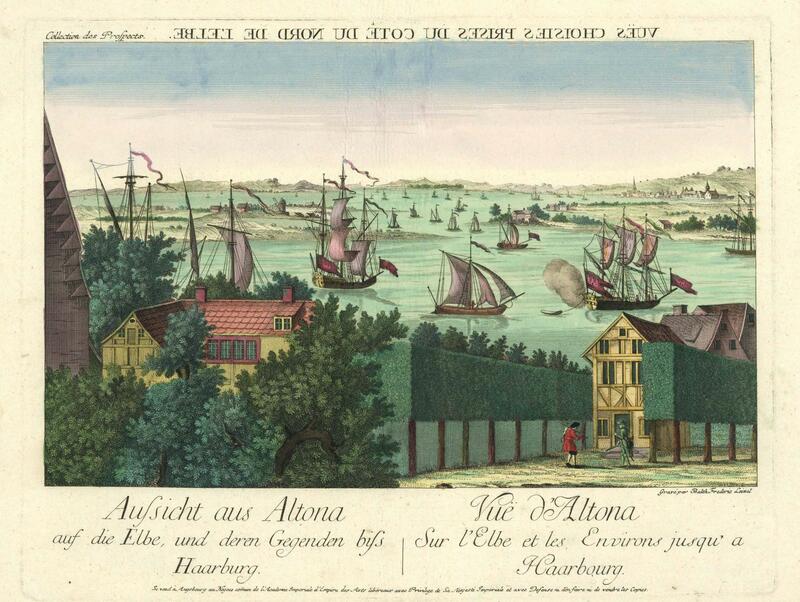 Blick von Altona auf die Elbe bis nach Harburg ('Aussicht aus Altona auf die Elbe, und deren Gegenden biss Haarburg - Vue d' Altona Sur l'elbe et les Environs jusqu' a Haarburg.'). 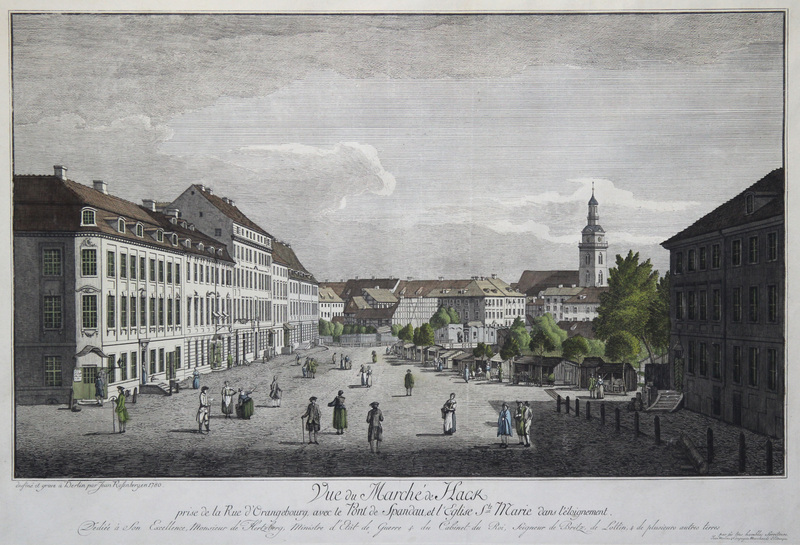 - altkolorierter Kupferstich v. Balthasar Friedrich Leizelt b. Akademische Kunsthandlung in Augsburg, um 1780, 29,5 x 37,5 Guckkastenblatt - optical view - vue d'optique - veduta d'ottica. - Perfekter Zustand! Methode nouvelle et generale pour tracer facilement des cadrans solaires sur toutes surfaces planes, en situation quelconque, sans calcul ni embarras d'instrumens. Par un seul probleme geometrique qui fait connaitre l'axe & la soustylaire, la latitude du lieu, la situation du plan, la declinaison du soleil & le parallele du jour lors de l'operation. 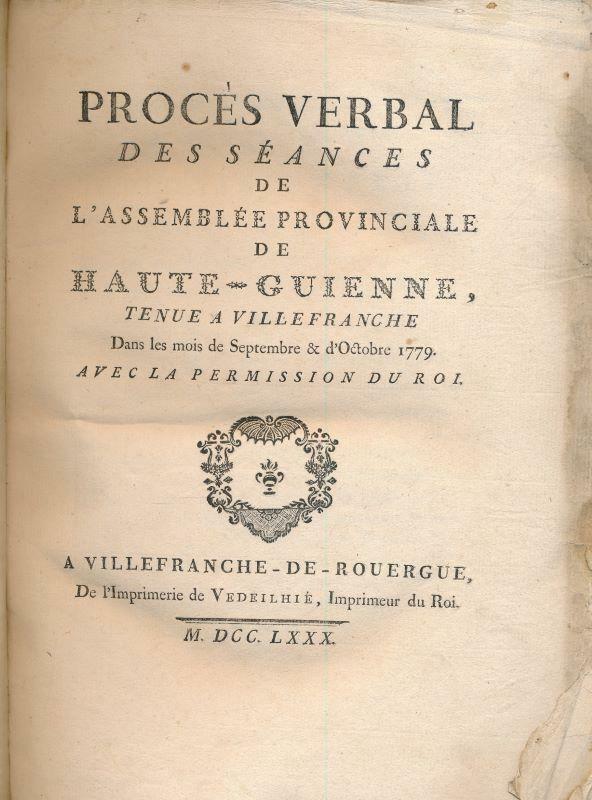 Principes et usage du comput et l'art de verifier les dates..
8, Fronti., XVI, XVII, 260 S., 2 Bl., 22 num. u. 1 unum. Kupferstich-Falttaf. 2 Teile in einem, aber durchgehend paginiert. Neues Titelblatt nach S. 151 (Druckort: Bayeux, Drucker: Antoine-J. Nicolle, 1780), HLdr. der Zeit, florale Rückenprägung, Schmutztitel mit Eckabschnitt, Frontispiz etwas wasserrändig, insgesamt schönes Exemplar. Erste Auflage. Gervais de la Prise, Architekt, Schüler der l'Academie Royale in Paris. [London]: Thomas Harrison, 1780. First edition. Removed. Very good, with minor wear to edges and margins, partial inked stamp on corner.. [3 pp.]. 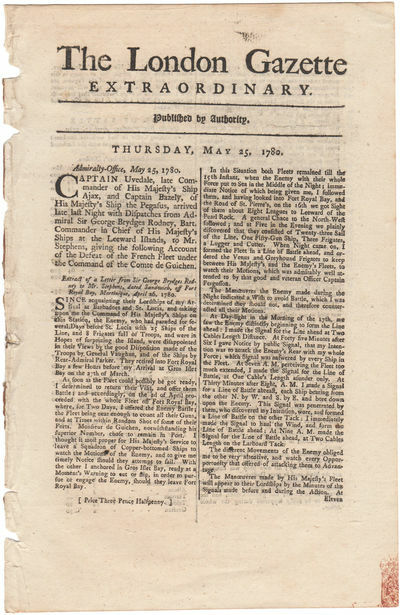 The first British report of the April 17th, 1780 naval battle near Martinique, West Indies between the British forces, including 20 ships of the line, led by Sir George Rodney and the French Squadron, with 23 ships of the line, led by Comte de Guichen. 470 were killed, 860 wounded, and a number of ships badly damaged. 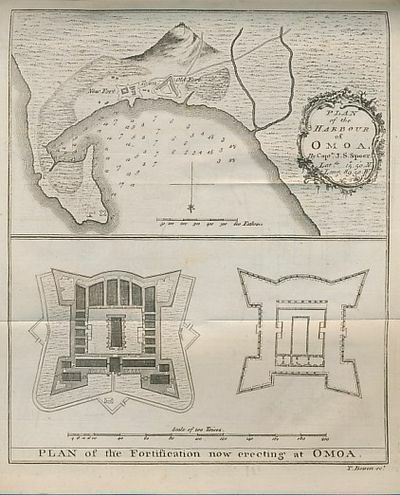 The French plans to attack and seize Jamaica did not succeed, but they did manage to avert a disaster and turn the battle into a draw, though you might not be able to tell that from the British report attributed to Captain Samuel Uvedale of the Ajax, whom Rodney had dispatched with the news of his victory. "The reality was much different, and deprived of what he had expected to be a glorious victory Rodney vented his wrath upon his subordinates whilst saving praise only for Captains Bowyer, Young, Molloy, Houlton and Douglas who received certificates commending their actions. Such was the veracity of his dispatch home, including comments to the effect that 'the British flag was not supported' that the first lord of the Admiralty, Lord Sandwich, felt constrained to edit parts before releasing it to the public in England" (Richard Hiscocks: The Battle of Martinique -17 April 1780 at "MoreThanNelson). In addition to the description, includes a list of the line of battle and the names of killed and wounded officers. Paesi Bassi 1780 - C115 CARTA DECORATA XILOGRAFATA POLICROMAProbabilmente Paesi Bassi 1780. Stampa xilografica a più legni con disegno in inchiostro nero e altri tre colori: giallo ocra, verde marcio e seppia.Fondo non colorato.Motivo:scena bucolica con vari animali ( pecore, maiali cervo) e un giovane che suona un clarino con la dama che lo ascolta. Dimensioni mm.442x370.Leggera piega centrale.Foglio intero, ottime condizioni.Questo tipo di decorazione veniva utilizzato anche per i tessuti da abiti e per questa ragione tali fogli venivano chiamati "kattunpapier"- carta di cotone.C115 DECORATED XILOGRAPHIC PAPER Holland 1780.Xilographic( woodblock) print with more woodblockes.Black, yellow, sepia and dark green color.Uncolored background.Decoration:bucolic scene with some farm animals(sheets, pigs,deer) and a young men playing clarino with the lady who listens to him.Sheet dimensions mm.442x370.Slightly traces of central folding.Full sheet, very good conditions.Such a type of decoration was also used for clothing fabrics and for this reason such sheets were also called "kattunpapier","cotton paper"
Artist: Bonne Rigobert ca ; issued in: Paris; date: ca1780 - - technic: Copper print; - colorit: original colored; - condition: Very good; - size (in cm): 29 x 45; - description: Map shows the north and sout pole with description; - vita of the artist: Rigobert Bonne (1727?1795) was one of the most important cartographers of the late 18th century.In 1773 Bonne succeeded Jacques Nicolas Bellin as Royal Cartographer to France in the office of the Hydrographer at the Depôt de la Marine. 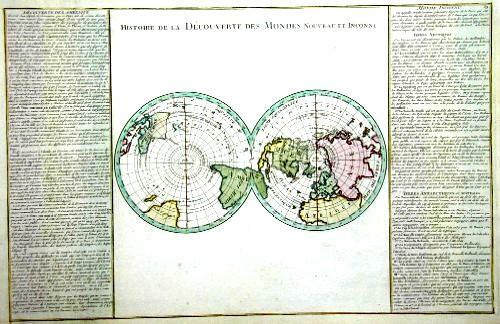 Working in his official capacity, Bonne compiled some of the most detailed and accurate maps of the period. 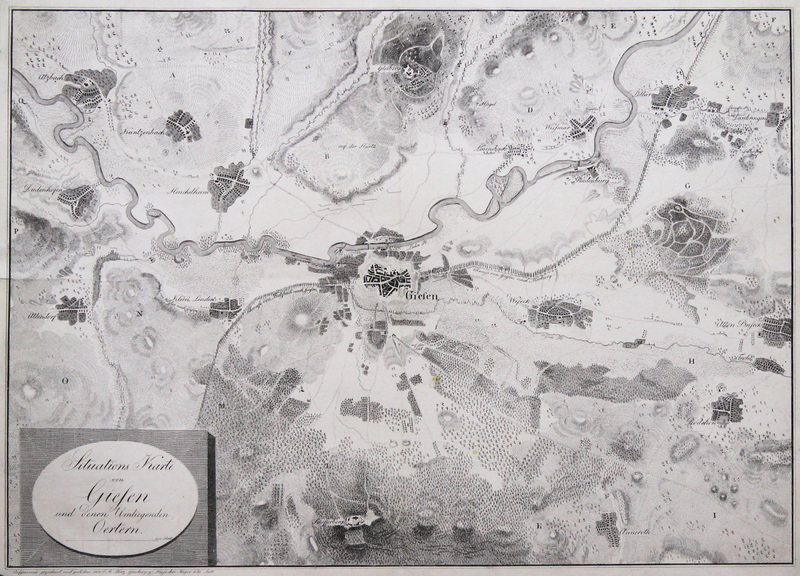 Bonne?s work represents an important step in the evolution of the cartographic ideology away from the decorative work of the 17th and early 18th century towards a more detail oriented and practical aesthetic. With regard to the rendering of terrain Bonne maps bear many stylistic similarities to those of his predecessor, Bellin. However, Bonne maps generally abandon such common 18th century decorative features such as hand coloring, elaborate decorative cartouches, and compass roses.While mostly focusing on coastal regions, the work of Bonne is highly regarded for its detail, historical importance, and overall aesthetic appeal. London: David Henry; Elizabeth Newbery. G : in Good condition without dust jacket. 20th century binding with new eps. Some foxing and set-off. 1780. First Edition. Buff hardback cloth cover. 220mm x 140mm (9" x 6"). vi, 628pp, [xvi] + plates. 14 b/w plates and maps (6 fold-out). 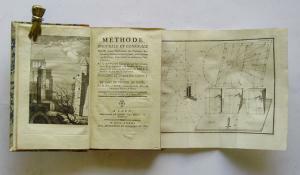 Includes an acoount of the death of Captain Cook. .
Recepte und Kurarten nebst theoretisch-practischen Anmerkungen. Geheimnisse einiger Philosophen und Adepten, aus der Verlassenschaft eines alten Mannes. 1. Theil [= alles Erschienene]. Erste u. einzige Aufl. 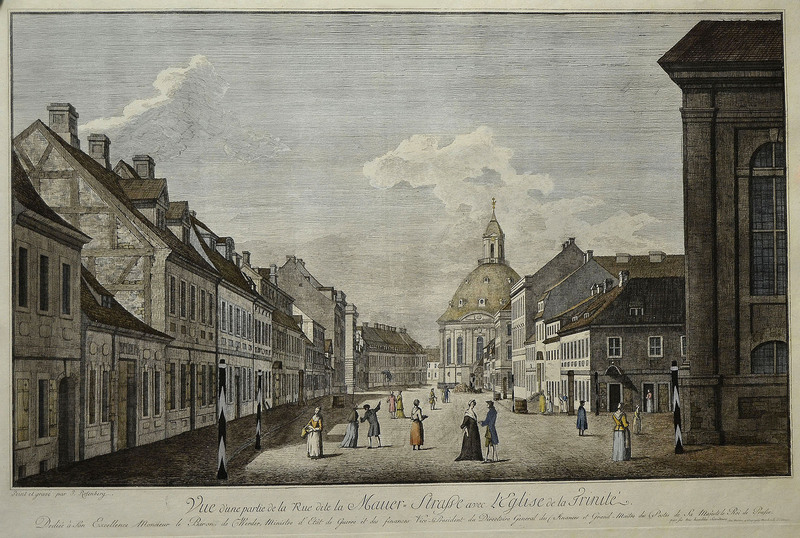 Leipzig, bey Christian Gottlob Hilscher, 1780. - 187 S., mit 1 gest. Falttaf., 8°, Pappband d. Zt. Ferguson I, 306; Duveen 242; Gardner, Bibl. Rosicruciana 259. - Enthält: (1) Lapis Philosophorum [.] Rore Coeli & Pinguedine Terrae ditissimum. (lat. u. dtsch. S. 3-46) - (2) Antonii a Terra F.R.C. [.] Regni Astralis Virtute & in Sublunaria Corpora potentia. (lat. S.46-53). 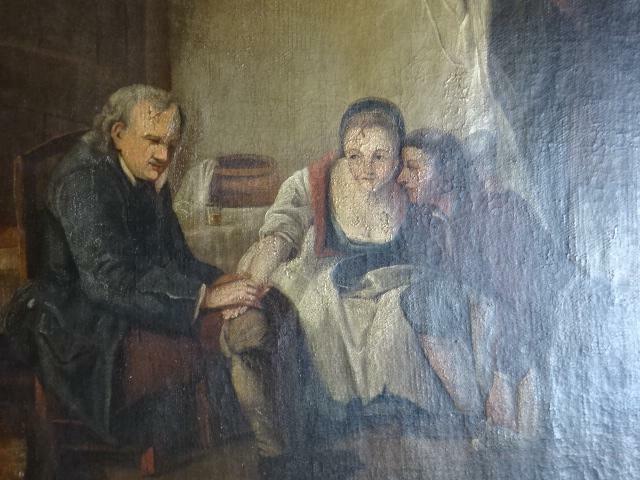 - (3) Abraham a Frankenberg. Illustrissimi Equitis Silesiaci, Processus singularis de Materia Chaotica. (lat. S.54-57). - (4) Ignatii a Lilienheim F.R.C. Processus de Floribus Aetheris captandis, singularis. (lat. S.58-61). - (5) Processus Anonymi cujusdam de Chaotica. (lat. S.62-66). 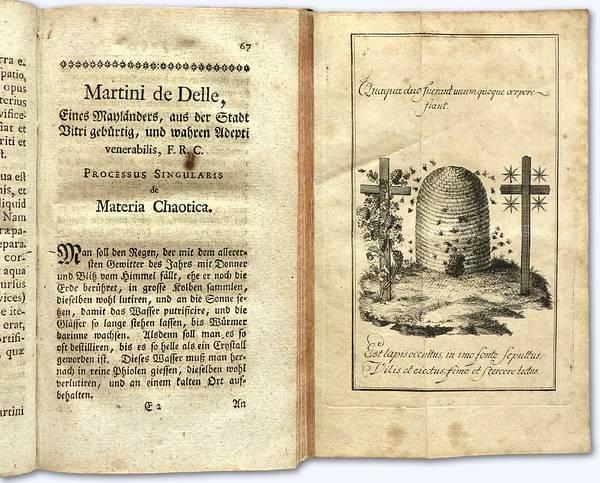 - (6) Martini de Delle, Eines Mayländers, aus der Stadt Vitri gebürtig, und wahren Adepti venerabilis, F.R.C. Processus singularis de Materia Chaotica. (dtsch. S.67-71). - (7) Arcanum Arcanorum Arcanissimum. (lat. S.72-73 u. dtsch. S.73-101). - (8) Illustrissimi Principis Americani, Nomine Holdazob a Dachem [.] cuncta Metalla in Aurum tingens. (dtsch. S.102-110). - (9) Arcanum. (dtsch. S.111-149). - (10) Diesen Uniuersal-Process hat ein sterbender Capuciner [.] hinterlassen. (dtsch. S.150-159). - (11) Mixtura praecipua Magistralis [.] de Holdazob a Dachem, Philosophus fine Pari fuit. (dtsch. S.160-172). - (12) Mysterium de Urina, daraus eine Tinctur zu machen, mit welcher andere Metallen können in Gold verwandelt werden. (dtsch. S.173-187). Rückseite des letzten Bl. mit interessanten VlgsAnz. zu alchemistischen Titeln. - Einband fleckig, bestossen u. beschabt; Frontispiz u. Titel fehlen (Kopien liegen bei, wobei das Frontisp. mit der vorh. Taf. fast identisch ist); erstes Blatt auf Vorder- u. Rückseite gestempelt u. leicht braunfleckig, sonst ein gutes Expl. London: Sabine and Son, 1780. 12mo. (7 x 4 inches). 96pp. 15 woodcut full-page illustrations. Publisher's wrappers, upper wrapper with a large woodcut portrait of Capt. Martel (repeated from the illustration on p. 27), lower wrapper with publisher's adsScarce 18th-century, illustrated chapbook edition of Johnson's "Lives of Pirates"This fascinating work, first published in 1724, was an instant success. The work remained in print in various languages throughout the 18th and 19th centuries - with over 30 editions being published before 1900. It now serves as one of the most important contemporary printed sources for information about the British pirates of the first decades of the 18th century. It includes chapters on all the great ones: Captain Avery, Edward Blackbeard Teach, Steed Bonnet, Bartholomew Roberts, Henry Morgan and others. Also includes chapters on two female pirates, Mary Read and Anne Bonny. 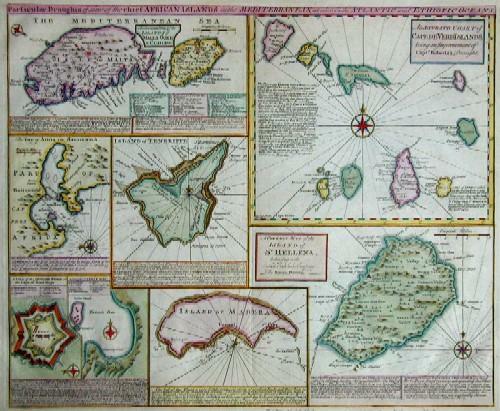 "This work is considered a sequel to Exquemelin's Bucaniers of America, and most of the pirates it records operated in the West Indies and American waters ... Nothing is known of the author who called himself Captain Johnson, and the name may be an assumed one. 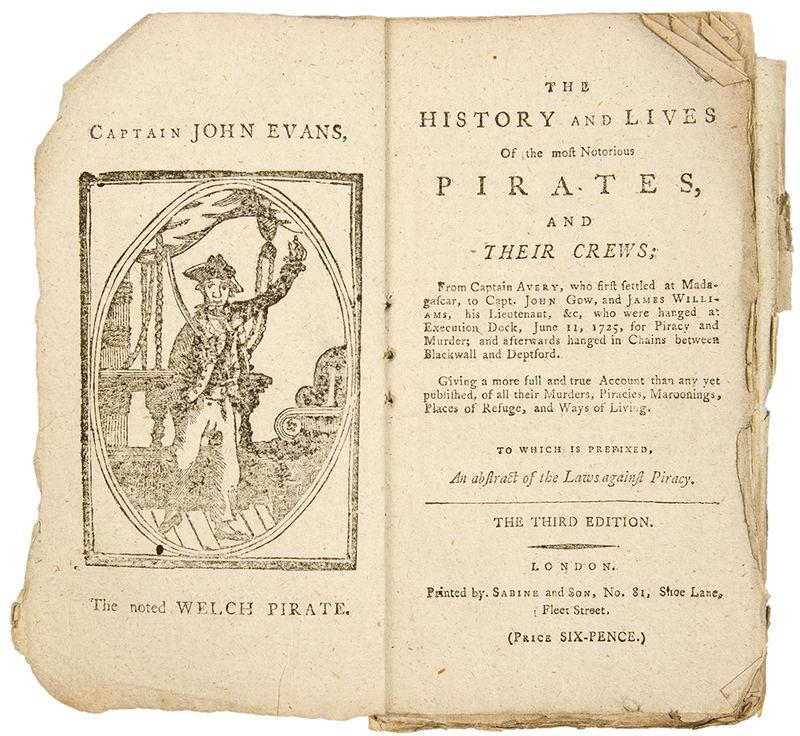 Beginning in 1724, and continuing to the present day, books on pirates have appeared under his name. There is no evidence to support the idea that Johnson was an actual pirate, even though his accounts seem remarkably accurate. There also appears to be little substance to the coincidence that a contemporary dramatist of the same name wrote a play, The successful pyrate, about a popular hero Captain Avery. J. R. Moore identified Captain Johnson as Daniel Defoe ... , but this was contested by P. N. Furbank and W. R. Owens in 1988, as well as by David Cordingly in a 1998 edition of Johnson. If the author was Defoe, it is interesting to note that he also wrote an elaborate review of the work" (Hill).Others, including his bibliographer Moore, have attributed the work to Daniel Defoe based on the internal relationship to his works of proven authorship (cf. J.R. Moore, Defoe in the pillory. 1939. p. 126-188). The National Maritime Museum notes that there is "considerable evidence' to suggest that 'Johnson may well have been a nom de plume used by Daniel Defoe" (Piracy & Privateering p. 83).This edition not recorded by ESTC and with only one example in OCLC. Italian castrato singer (1780-1861), Velluti was the last of the great castrati, created roles in operas by Rossini, Meyerbeer and Niccolini. Signed concert pass, handwritting, "New Argyll Rooms/Benefit Concert, Monday Morning 26th May 1828. Admit One". Size is 4.5 x 2.5 inches, in fine condition. Rare! 1780. Incisione in rame di Lattrè, interamente colorata d'epoca, mm 500x660. Tratta da " Atlas modèrne ou collectiòn des cartes". Bell'esemplare con bel cartiglio figurato; qualche piega. 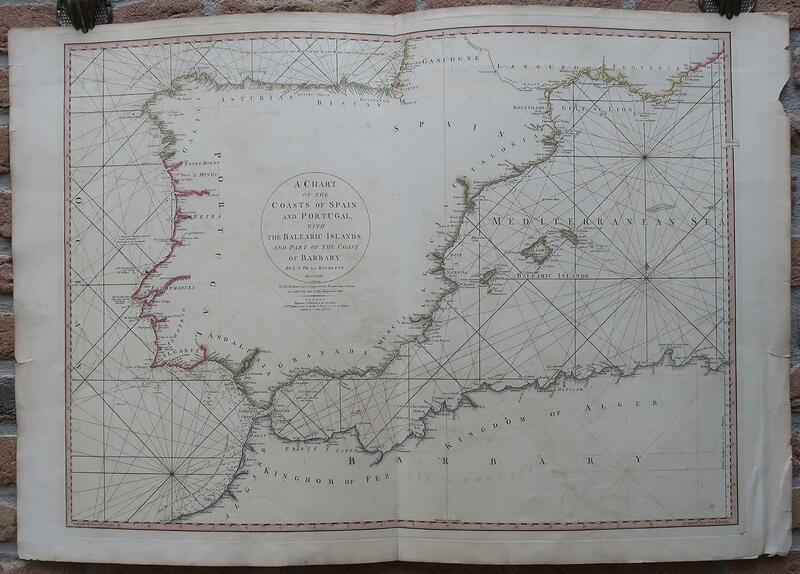 Artist: Bowen Emanuel ca ; issued in: London; date: ca1780 - - technic: Copper print; - colorit: original colored; - condition: Very good; - size (in cm): 35 x 42,5; - description: Map shows the island of Malta with Gozo, Teneriffa, Islands of Cap Verde, Madeira, St. Helena, the bay of Agoa de Saldanha, Dutch Fort at Cap of good hope and Table Bay with Robin Island; - vita of the artist: Emanuel Bowen (1714- 1767 in London) was an English map engraver, who worked for George II of England and Louis XV of France as a geographer. In spite of his royal appointments and apparent prosperity he died in poverty and his son, who carried on the business was no more fortunate and died in a Clerkenwell workhouse in 1790. Midnight the Signal. Sixteen letters to a lady of quality. 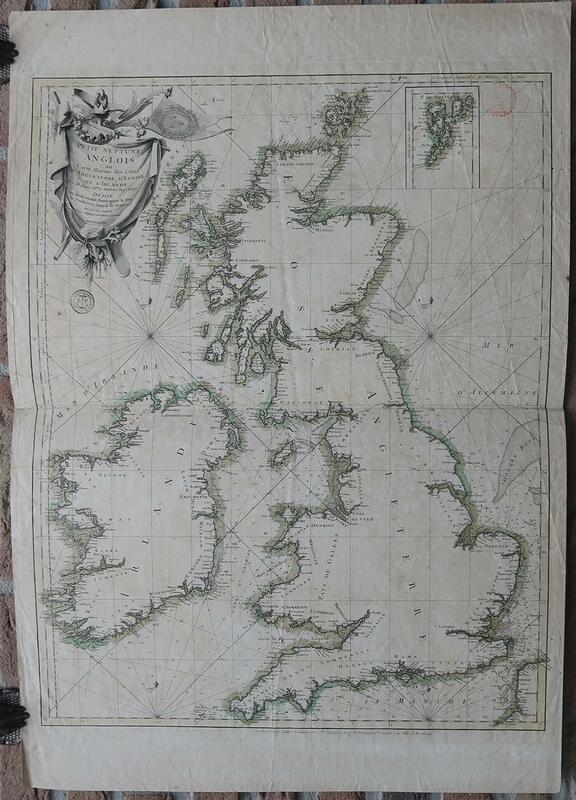 (London), sold by Dodsley, 1779. 3 Bll., 230 S., 1 w. Bl. 3 Bll., 226 (recte 224) S., 1 w. Bl. Mit 2 Kupfertiteln. Kalbslederbände d. Zt. m. RSch., RVerg. und Kantenvergoldung (berieben, etw. bestoßen). 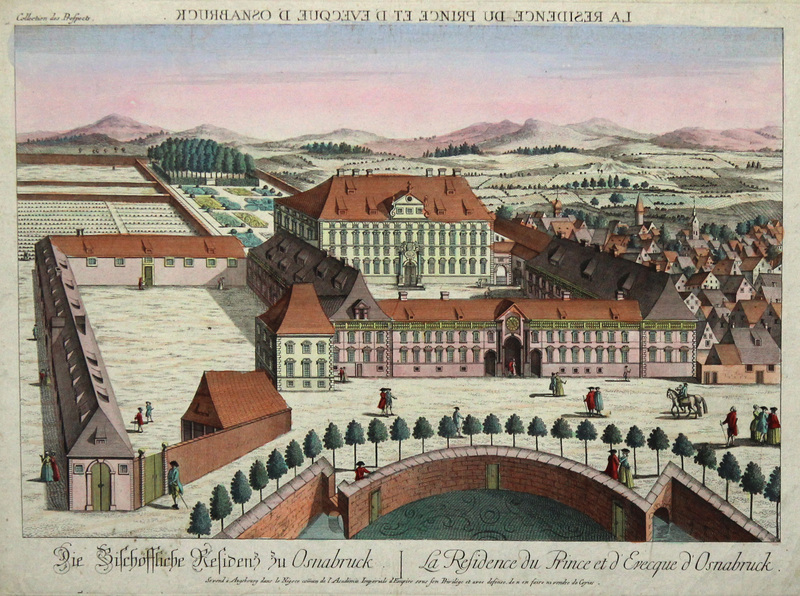 Schloss und Hofgarten ('Prospect des Marggräfl. Schlosses und Gartens zu Schwedt'). 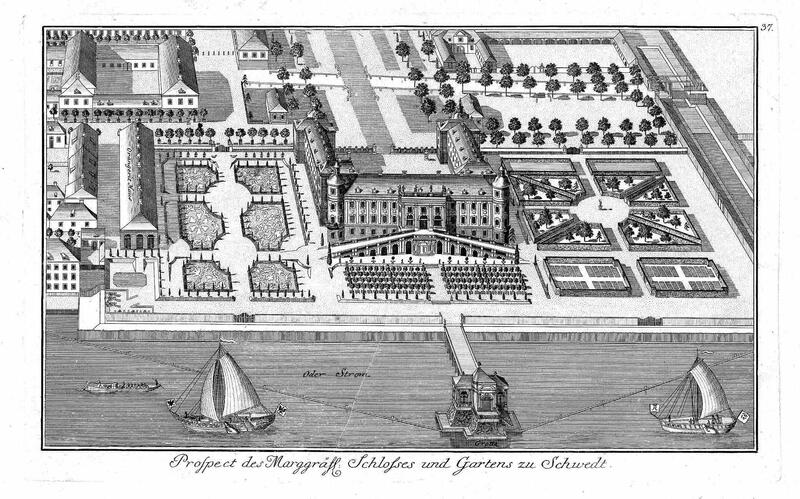 Lustschloß Herzog Anton Ulrichs von der Vorderseite mit Gartenanlage aus halber Vogelschau ('Prospect des Herzogl. Braunschweigischen Lust Schlosses und Gartens zu Salzdalem'). Magd mit zwei Herren. Öl auf Leinwand. Um 1800 (?). 76 x 60,5 cm. Gerahmt. 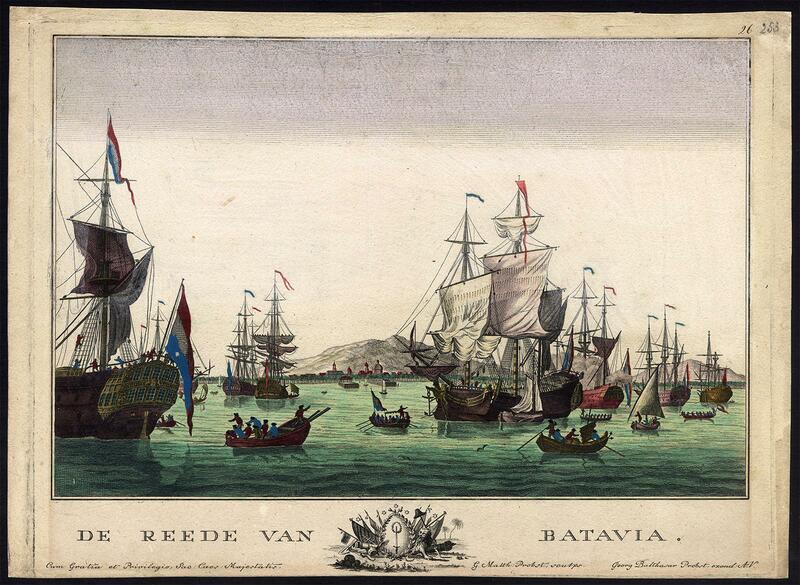 - Antique print, titled: 'De Reede van Batavia.' - East India merchant ships and some sloops near the harbour of Batavia, present day Jakarta, Indonesia. 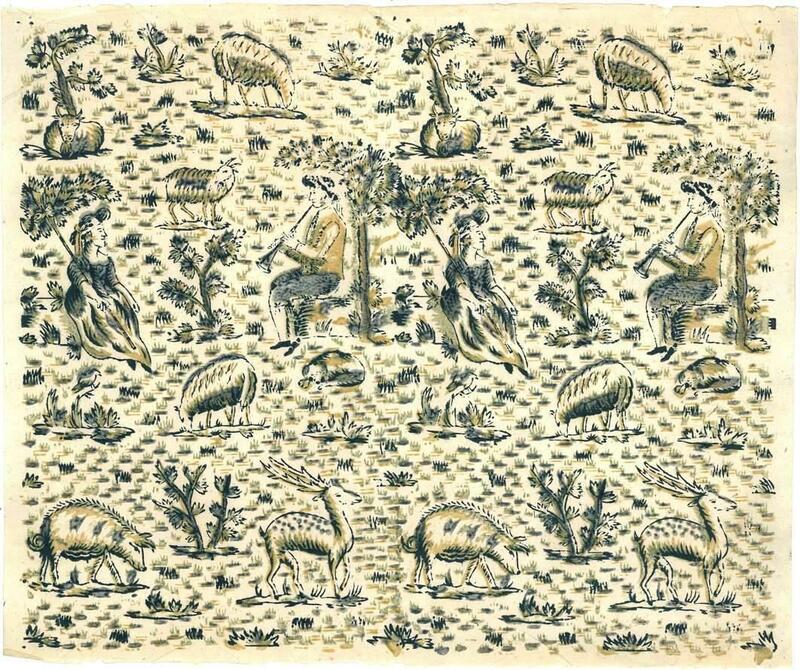 This is an optical print, also called 'vue optique' or 'vue d'optique', which were made to be viewed through a Zograscope, or other devices of convex lens and mirrors, all of which produced an optical illusion of depth. Handcoloured engraving on hand laid paper. 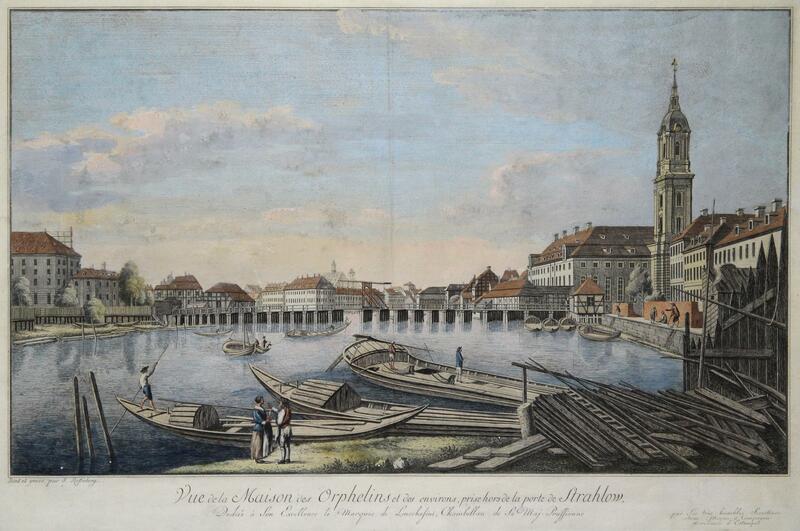 Description: Published by Georg Balthasar Probst (1732 - 1801) who was a German artist, engraver and publisher in Augsburg, a major European publishing center in the 17th and 18th centuries. 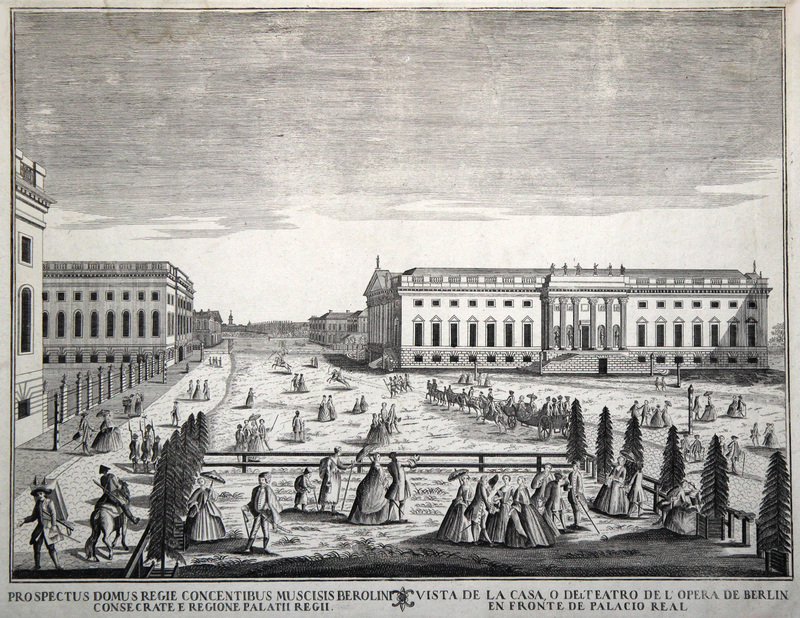 He produced architectural views of places around the world, including vues dï¿½optique, which were published in various places during the last half of the 18th century, including Paris, Augsburg and London. Artists and Engravers: Made by 'Georg Matthaus Probst' after own design. 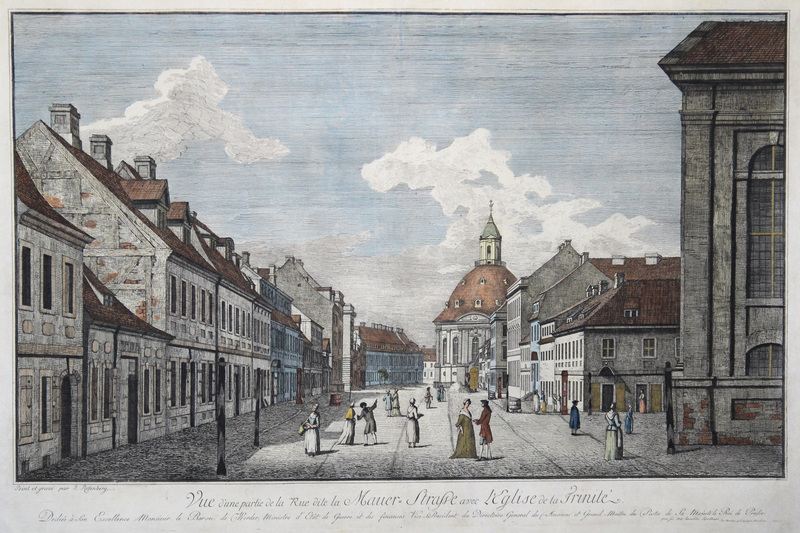 Georg Matthaus Probst (d. 1788) was an engraver from Augsburg, Germany, son of Georg Balthazar Probst. Condition: Very good, given age. Old colouring. Some faint soiling in the margin. Edges reinforced on rear. General age-related toning and/or occasional minor defects from handling. Please study scan carefully. Storage location: R1-024 TPC The overall size is ca. 17.9 x 13 inch. The image size is ca. 16.1 x 12.4 inch. The overall size is ca. 45.5 x 33 cm. The image size is ca. 41 x 31.5 cm. Opera. Recognovit, emendavit, supplementis explevit Gabriel Brotier. Mit Titel-Vignetten u. Stammtafel der Cäsaren. 5 Bde. , n.d. n.d.. Piece of granite, 3â x 2â x 0.5â. Fine condition. From the John S. Reigart Collection of Historical American Relics.Attached to a card with string. A label was then affixed to the granite upon which Reigart neatly penned, âCell of / Major Andre / A.D. 1780.â The card originally measured 3.25â x 4â, but the upper right has been torn off. Letters and words missing are in brackets. Reigart wrote on the card, âPiece of [the Cell] / in which Maj[or Andre] / was confined dur[ing the] / American Revoluti[on] / (at Fort Putnam, West [Point] / New Yor[k].âJohn S. Reigart was born in 1833 or 1834 in New York City where he resided for most of his life. By occupation, he was a bank clerk with very precise penmanship which is evident on his identification card and label. During the mid and late 19th century Reigart assembled a comprehensive collection of relics from every period of Americaâs history. He was clearly aware of the importance of provenance of all the pieces in his collection and included detailed documentation in the form of period ink script notes, most of which he attached to the actual artifacts. 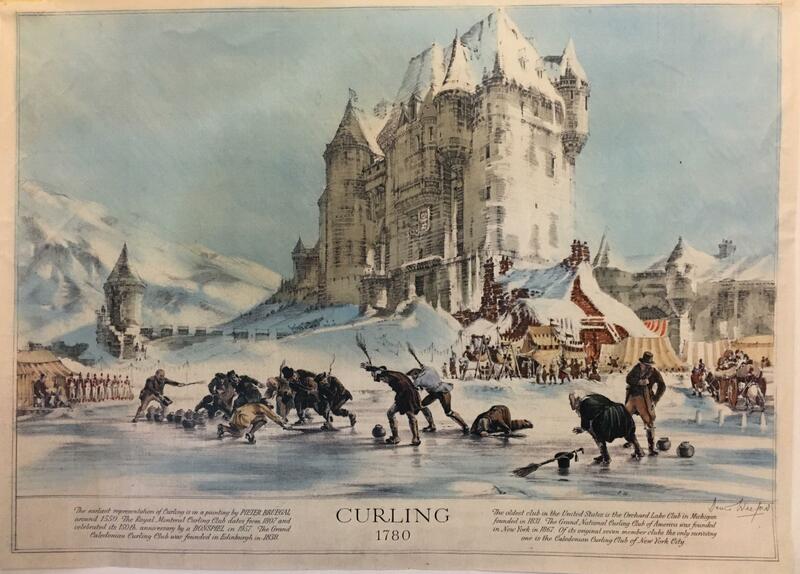 About ten years ago, Reigartâs collection was discovered in the estate of a deceased Connecticut book dealer. Versuch über die natürliche und politische Geschichte der böhmischen und mährischen Bergwerke. 2 Teile und Beilagen in 1 Band. - 6 Antique prints, titled: '1. Petite Gabare appareillant. - 2. Petite Gabare a la Voile. - 3. Bugalet a la Rame. - 4. Bugalet allant Vent arriere sous la Misaine.- 5. Bugalet serrant le Vent arriere sous toutes ses Voiles. - 6.Bugalet revirant Vent devant.' - Series of 6 ships from the port of Brest, France. 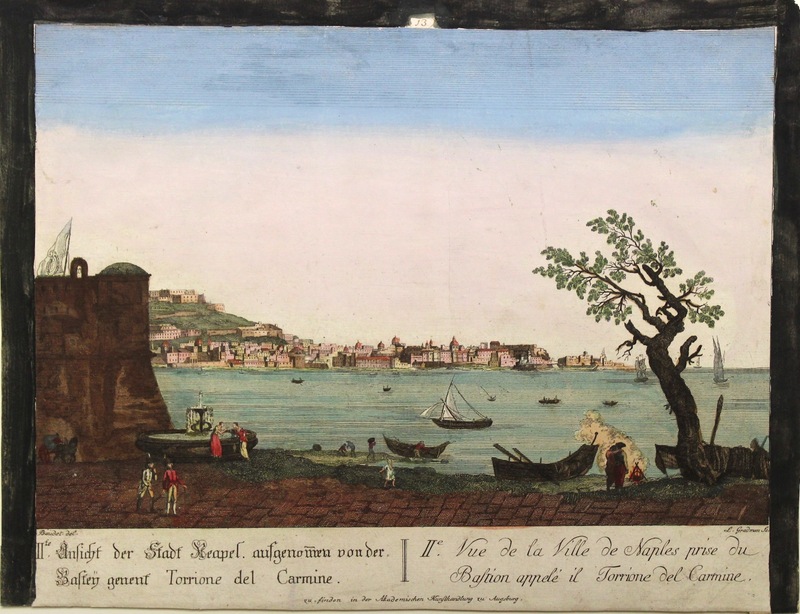 Attrractive and finely engraved coastal views with ships, boats (scow, bugalet) and figures. Etching and engraving on hand laid paper. 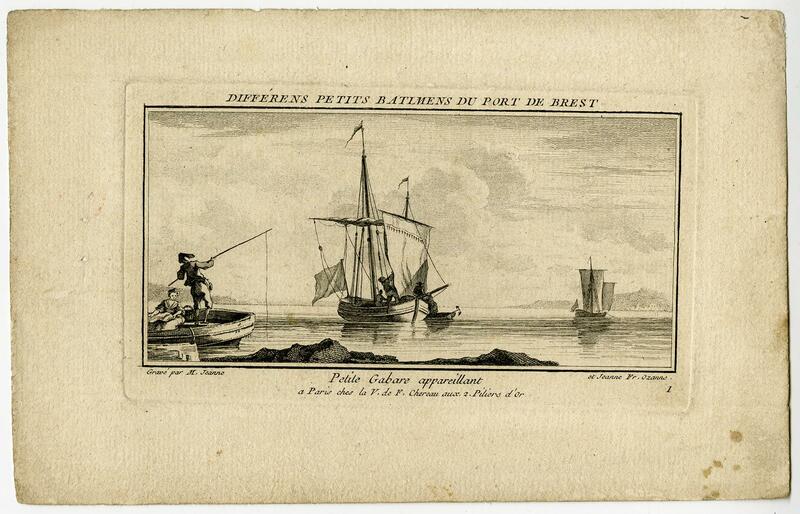 Description: From: 'Differens petits Batimens du Port de Brest. 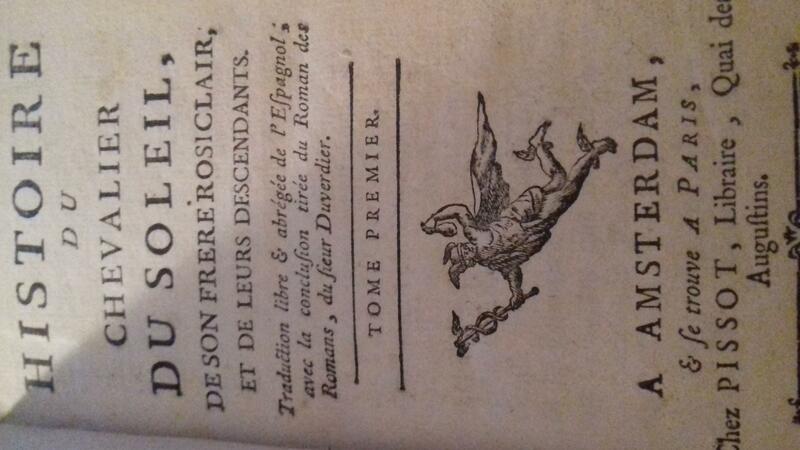 ', published in Paris by la V. de F. Chereau aux 2 piliers d'or in 1780.Artists and Engravers: Made by 'Marie-Elizabeth Ozanne and Jeanne Francoise Ozanne' after own design. Marie-Elizabeth Ozanne (1736-1786) Jeanne Francoise Ozanne (1734-1795). Condition: Very good, given age. Small stains in margin. Margin with light soiling. Two original holes in in left margin from binding. General age-related toning and/or occasional minor defects from handling. Please study scan carefully. Storage location: Q1-111 TPC The overall size is ca. 8.6 x 5.5 inch. The image size is ca. 5.9 x 3.1 inch. The overall size is ca. 21.8 x 13.9 cm. The image size is ca. 15.1 x 8 cm. , 1780 - 1790. 1780 - 1790. Archive contains: Hendrik Wyckoff manuscript document signed Rev. War dated from New York, Oct. 11, 1780. 1 p. Reads in part: "Strict attention it is expected will be paid by the Officers to Brigade Orders of the first Instant, Commanding Officer of Companies who have neglected to deliver in their return as directed by Brigade Orders of the 15th of last Month will deliver their returns to the Adjutant without delay... 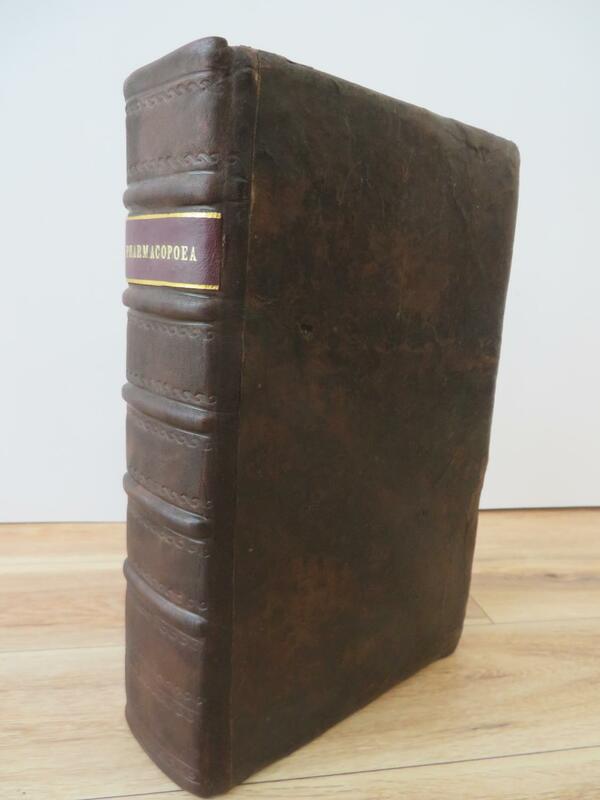 Commanding Officers of each Company will Provide themselves each with an Orderly Book in Order that all the general, Brigade, & Regimental Orders may be regularly & properly entered... ." Worn at folds, nicked at edges. David Wolfe. New York, Sept. 28, 1790. ADS "David Wolfe Major/Commandant the third/Regt," 1 p. In part: "The fifth day of October next is appointed by General orders for the Annual Review and inspection of the Brigade, & for that purpose the Commanding Officers of Companies are to assemble their respective compainies (sic) on their several parades on that day in the morning... The Drums of the Regiment are to assemble in front of Saint Pauls Church at 7 oClock in the morning & Beat the General down broadway through John Street up Queen Street... ." Nicks at edges, portion missing at lower right corner. Gerard Rutgers. New York, Oct. 5, 1790. Manuscript Document Signed: "Gerard Rutgers," 1 p. Docketed on verso by Major David Wolfe: "Maneuvers/Brigade Parade." Headed: "Maneuvers for 5th Octr. 1790." In part: "1- Review Regts present in Succession as the Officers come to their fronts. 2- Wheel by platoons - and pass the reviewing Officer as Usual. 3- Open Ranks and perform the Manual. To prevent Mistakes, The Legion & the 2 Regt perform together first- The first and 3d next, and the 5th and 4 Regt last as described under... Orders will be Communicated by the Drums... ." This document lists the maneuvers (including a diagram) for one of the brigades ordered to parade in Major Wolfe's Sept. 28, 1790 document. Good condition. David Wolfe. New York, 1790. ADS: "By David Wolfe Major Commandant of the third Regiment of Militia, in the City and County of New York," 1.25 pages. Major Wolfe has written the format for a "Warrant to Collect Fines for non appearance" of a Private in the Regiment at any place he was ordered to appear, "being duly Warned... and if any of the Persons aforesaid are under the age of twenty one years, apprentices, or Servants, you are hereby further authorized and Required, to Demand and receive the said fines from the Father or Mother, Masters or Mistresses, of such respective Infants, apprentices or Servants... ." Nicks at edges.